Breast cancer remains the second leading cause of cancer deaths in females worldwide. Although necessary improvements in breast cancer diagnosis and management have been made, early detection and anti-metastatic treatment of breast cancer remain a crucial challenge. Preclinical studies of the 4T1 metastatic mouse xenograft model can help overcome these limitations, which is critical for patients with advanced stage disease. The 4T1 tumorigenic epithelial cell line is derived from the mammary gland tumor of a mouse and is resistant to 6-thioguanine without mutagen treatment. According to a 1992 article in Cancer Research, when injected into BALB/c mice, the 4T1 cell line can spontaneously metastasize to both the lung and liver and form visible nodules in these organs. The 4T1 cell line is particularly useful for stage IV human breast cancer research since tumor from this cell line mimics human breast cancer and readily metastasizes through mice, making a suitable breast cancer model. Liu et al. 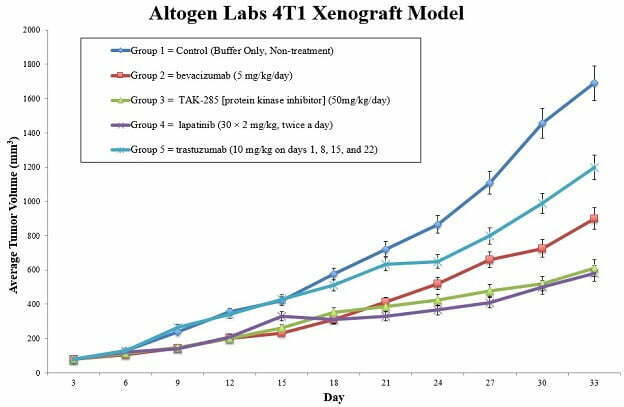 (2014) used an orthotopic 4TI xenograft model to demonstrate inhibition of the Fas signaling cascade suppresses tumor metastasis and growth and reduces Fas-initiated inflammation in breast cancer, thereby establishing Fas signaling as a potential therapeutic target. A Cell study (Aceto et al., 2014) used a 4T1 xenograft model to define that circulating tumor cell clusters (CTC clusters) present in cancer patients’ blood originate from primary tumors and greatly contribute to metastatic spread of the cancer. Gao et al. (2011) used a murine 4T1 model to test breast cancer formation and metastasis after treatment with doxorubicin (DOX) delivered via pH-sensitive micelles. They found that a polymeric micelle formed with both poly(L-lactide) (PLLA) (Mn 3000)-b-poly(ethylene glycol) (PEG) (Mn 2000)-folate and poly(L-histidine) (PHis) (Mn 4700)-b-PEG (Mn 2000) loaded with DOX prevented metastasis and prevented tumor growth, thereby reporting a novel method for the safer delivery of a known chemotherapy agent. The 4T1 cell line is routinely used to create the CDX (Cell Line Derived Xenograft) 4T1 xenograft mouse model. Upon implantation, the production of colony stimulation factors, cytokines, chemokines and angiogenesis factors allows the 4T1 tumor cells to metastasize efficiently. The 4T1 metastatic model enables the study of late-stage breast cancer therapeutic agents. Flasks of 4T1 cells are maintained under conditions of exponential growth prior to injection. 4T1 cells are prepared for injection by trypsinization and viable cell counts are determined using trypan blue exclusion (98% cell viability required). Cell suspension adjusted to appropriate density. Each mouse (NOD/SCID, 10-12 weeks old) receive a subcutaneous injection of one million cells in the flank of the hind leg in a volume of 100 microliters of the Matrigel 4T1 cell suspension. The injection sites are palpated three times weekly until tumors are established. Tumors are then measured using digital calipers until they reach an average size of 50-150 mm3. Animals are randomized into treatment cohorts and administration of the compound of interest is performed according to the treatment schedule. Tumors are measured daily and mouse weights are recorded 2-3 times weekly. Animals are euthanized when tumor size reaches 2,000 mm3 or the predetermined size limit per approved IACUC protocol. Necropsy and tissue collection are performed as defined for termination of experiment. Tumors are excised, weighed and documented by digital imaging. Standard gross necropsies are performed and tissues are collected for downstream analysis. Tumors and tissues can be snap frozen in LN2, stabilized in RNAlater reagent or prepared for histology. 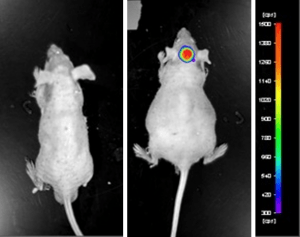 An example of Altogen Labs contract research study using a luciferase expressing U87-luc cell line to monitor in vivo tumor growth. The same concept of tumor observation using in vivo imaging is incorporated in metastatic tumor models. Figure 1. Luciferase expression in U87-luc orthotopic model. Control and implanted glioma mouse model luminescence was analyzed 10 minutes after intraperitoneal luciferin injection.